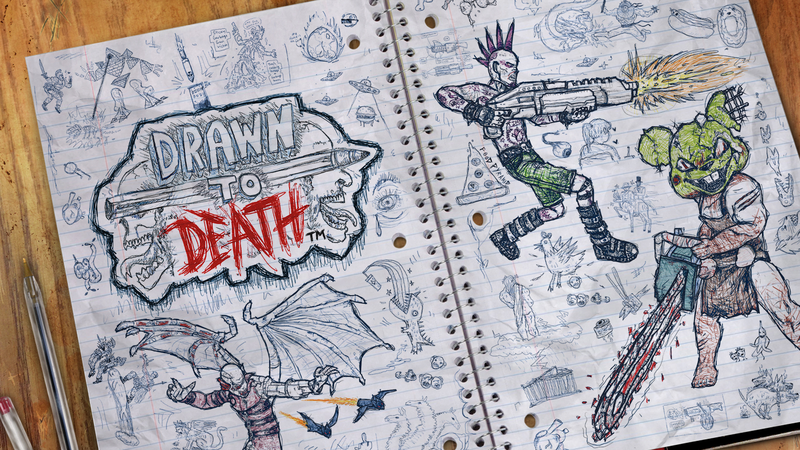 Hidden within the pages of it's teenage angst, Drawn to Death has the potential to be a popular arena shooter. Especially being free with PlayStation Plus. To be completely honest; I hate this game, I really do. I can't stop playing though. Maybe because it has that Twisted Metal arena vibe to it? The game takes place in a high school kids notebook. All an expression of his imagination while he sits bored in class. 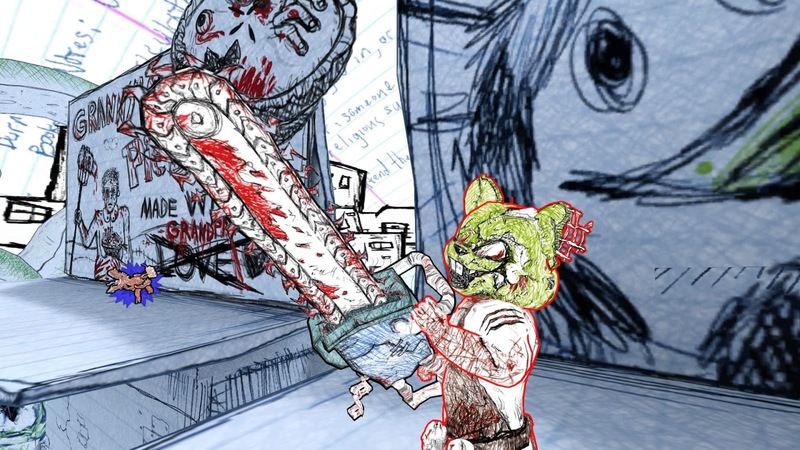 A neat thing is the trophies and character bios of Drawn to Death tell a story of the kids day to day life. It's a nice little touch to kind of give you a look into the "creator" of the world you're playing in. The first thing that caught my eye was how good the art style is. Everything from the menus to the characters and items look like they have been hand drawn and it looks fantastic. Each arena looks great and if you look around the arena you can find little drawings/notes that relates to the kids everyday life, which is pretty neat. There are portals you can go through to help you escape from the enemy or flank. The gameplay itself isn't too bad either. Plays like most arena shooters but falls a tad short due to a four player limit. Maybe in a future update there might be a mode with room for more players but it feels a little empty sometimes on certain stages. Other stages fit that mold perfectly. You unlock weapons by gaining XP which fills up a blood key. 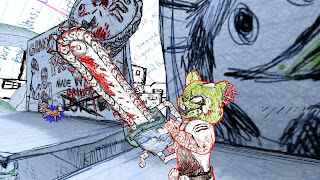 Each weapon has its own damage; some weapons are quite overpowered such as the Russian Jackhammer and the Star Laser 3000 but that's known for happening in these types of games. With the use of plenty creative weapons such as the J-RPG which is a console rocket launcher that shoots missiles that explode in 8-bit goodness. There are also two different versions of it. One is a "Used Copy" and the other is a "New Copy". There are different weapons involving people/animals; Dodge ball Dan, Emily, and the Evil Monkey. Once the timer gets close to zero, the announcer will make you aware of a golden gun that has been placed on the stage for you. There are a few different games modes. You have your Deathmatch, Team Deathmatch, and the really fun Organ Donor Game mode. In Organ Donor every time you kill an enemy they drop a heart. After collecting one or numerous hearts you go to the deposit and let the meter fill up and you get points according to the amount of your deposit. There are areas that are stationary that give you points according to the amount of hearts you have and moving areas that give you double points. Which is the most powerful gun in the game to help close in on a win. Each of the six characters have their own special abilities, as well as weaknesses/strengths to other characters. A melee attack might do more/less damage, or a special ability could be negated if activated on a specific character. It's a nice touch and throws a challenge into the game itself. Sometimes it doesn't matter though if everyone decides to be the same character *cough* Alan *cough*. There is one problem with this game and drags it down a tremendous amount. The "humor." I'm totally fine with immature jokes because I make those type of jokes all the time; but the amount of language/offensive humor in it is ridiculous. While playing the game with every kill, special move, item grab, death, spawn, basically anything you do, the announcer is making some remark that usually ends with a flurry of language. Including a 45 second rant about how the kill you got gave him an erection. Though I'm totally fine with all of that but it's all said so often you'll hear them a good 20 times a game (kind of an over-exaggeration). It's incredibly annoying but luckily you can turn the narrator off (Thank God). He is without a doubt the worst part of this game. The tutorial was unnecessarily long and could've been cut down to about half if they didn't have to stop after every movement for a frog to tell you what to do and also rip into you in about two paragraphs each time. The only good part about the tutorial though was when they tell you to reload; they tell you to actually say "reload". After failing they tell you to say it a little louder, maybe yell it out. Then they get you with the psyche. It was very clever. I fell for the first part but I didn't want to yell reload in my house, my friend playing with me however, fell for it. And it was hilarious. On top of all of this there are taunts and gifs you are able to show on screen when you're in the lobby, get a kill, and win a match. All of the gifs are obnoxious and terrible, with the exception of one that got a chuckle out of me. The only reason I can believe that they felt all of this terrible humor is okay is due to the game taking place in a High-Schooler's notebook. Since it's an immature kid it makes sense that this type of humor is present. It doesn't make it okay though. It negatively impacts the game and it suffers strongly from it. None of this offends me though. It's just embarrassingly obnoxious and lame. Not even stupid teenage me would've thought any of this was funny. 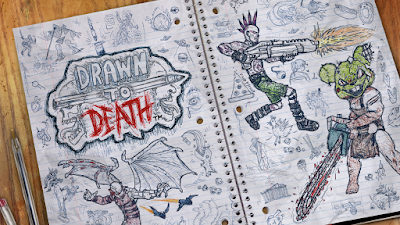 Even with all of the obnoxious flaws Drawn to Death presents, it's still a game worth giving a shot at. It has potential and I have high hopes for it. As long as it keeps a player base it should be around for quite awhile. They just have to draw out better plans in the future. More characters, new weapons, arenas, cutting down the humor/announcer's comments, etc. It could really make the game great. It already has a unique style and it's pulled off quite well. Though in all honesty it's not worth $19.99 right now. We'll have to see what happens! LAN Mob's First AMA - Featuring Tokaido! PaRappa The Rapper Remastered Review!